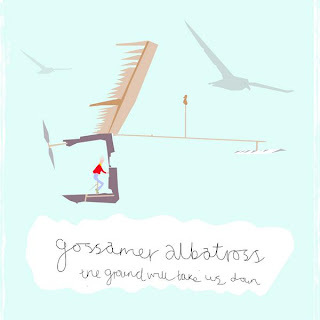 Having first appeared on this blog in [September 2007] as a recommendation from Adam of the now extinct blog, A Disgusting Blemish, this month finally sees the birth of the debut single proper from Gossamer Albatross - the double a-sided 'The Ground Will Take Us Down'/'Elizabeth, Queen Of The Sea' on 7" vinyl. There's something delightfully autumnal about the Herefordshire quartet, like watching the leaves slowly metamorphosing in colour then falling gently to the ground. Except it's not gentle. As I witnessed at a recent live performance in London, there's a sense of rich intensity everytime a note is struck, be it by the resounding vocals or by the hypnotic instrumentation. Indeed, Lewis Gordon's resonant vocal expression would be fantastically captivating without being generously laden by a magical folk-pop backdrop. Here is 'Elizabeth, Queen Of The Sea' from the forthcoming single, a track that I uploaded in its demo form back in April. 'The Ground Will Take Us Down' is out now on Bailiwick Records, limited to 500 copies. Buy directly from [Bailiwick] or from [Puregroove]. p.s is anyone else dying of (man)flu? It's terribly inconvenient.